This gorgeous girl has been coming to visit us for a LONG LONG time, she is a member of our family and we absolutely adore her! This is Carly our Dog of the Month (DOTM) for April 2018! Meet Journey, the DDG Dog of the Month for March 2018. She is a gorgeous Shepard that is full of fun, love and personality. 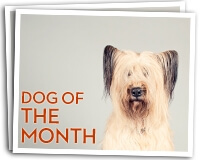 This good looking Cavapoo is our dog of the month for February. His name is Murphy and we couldn’t love him more. Check out what makes him our February 2018 DOTM!